I designed this Christmas card for my grandmother’s cards this year. Every year I make cards for her to mail to family and friends. She has recently moved to Kentucky and this is my first year of not going to her house for the holiday. She’s only been moved a couple of weeks, but I miss her so much. 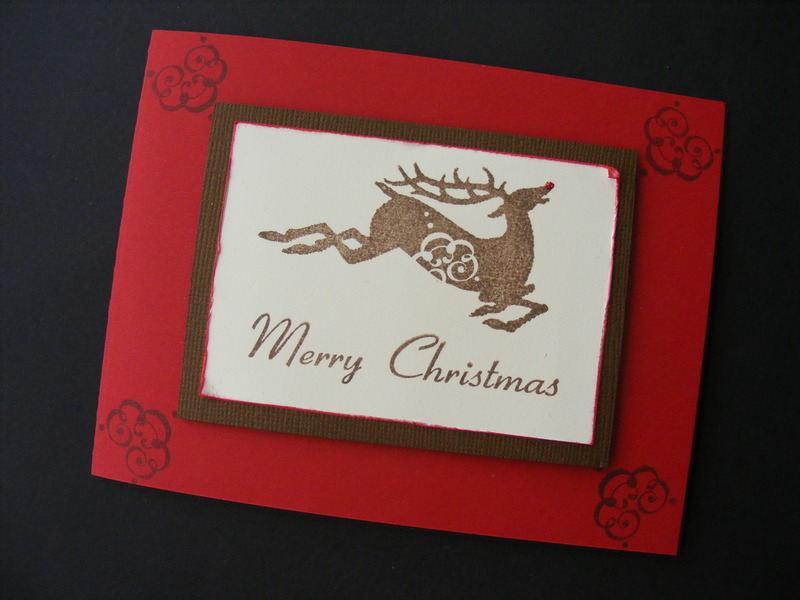 I stamped the reindeer and “Merry Christmas” using Burnt Umber on vanilla cardstock. Then before I mounted it to the brown cardstock I distressed the edges, dragged them in Moulin Rouge and curled up 2 opposite corners. I used red Stickles to make his nose shine. This entry was posted in Cards, Rubber Stamped Items and tagged Brown, Card, Christmas, Nose, Red, Reindeer, Rubber Stamps, Rudolph. Bookmark the permalink.